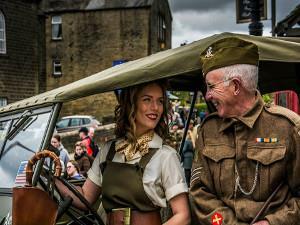 Haworth's Annual 1940s nostalgic 2 day event, come along and soak up the brilliant atmosphere, enter into the spirit of the era by dressing up and joining in too. Events take place throughout the village, including vintage vehicle displays, evacuees event, re-enactments, speeches from Churchill, jive dancing, singing and bands playing. * In the interests of racial harmony and public decency we respectfully request that no Nazi insignia or uniforms are worn at our event.